How often do wear the skirts you have in your closet? I’ve had a professional office job in the health care industry for the past 13 years. Over these years, I have cultivated a professional wardrobe that includes many skirts. I really love my work clothes, and for a long time they remained just that – clothes only for work. Part of this separation within my closet had been in an effort to keep my office clothes in good condition so they last as long as possible, and partly this had been to separate my work life from my evenings-and-weekends life. I realized that this policy of separate wardrobes was limiting me. I had become bored with my strictly-work clothes and uninspired with my casual clothes. This made me feel like I often had nothing to wear. Ack. 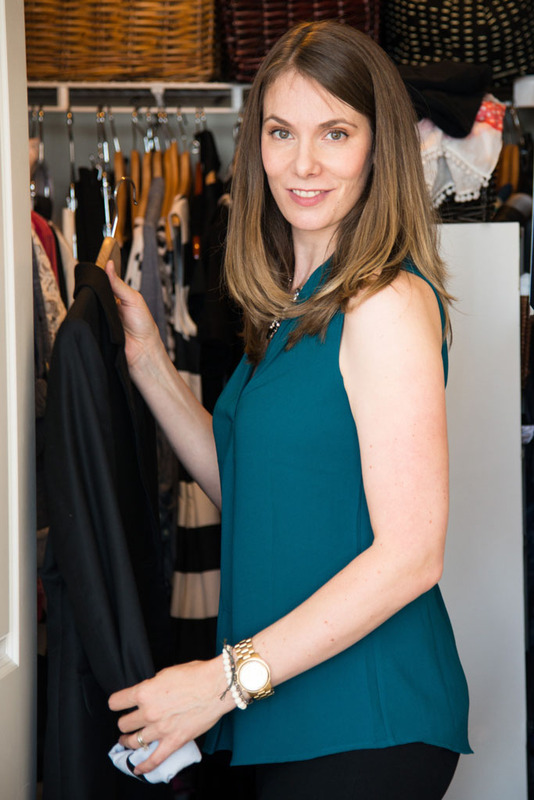 The dreaded closet problem that plagues so many of us. A closet full of clothes and nothing to wear. A few years ago, I started mixing my suit jacket with my jeans and it was a game changer. A blazer thrown over almost anything – a floral dress, boyfriend jeans, an old band T-shirt – is an instant improvement for your casual clothes. We’ve talked before about wearing your dresses multiple ways in order to increase their versatility in your wardrobe. Why not try wearing your work-ready skirts for your casual plans? Here are three guaranteed ways to make your skirts ready for weekends. When you pair anything with sneakers, the dressed-up factor is drastically reduced. 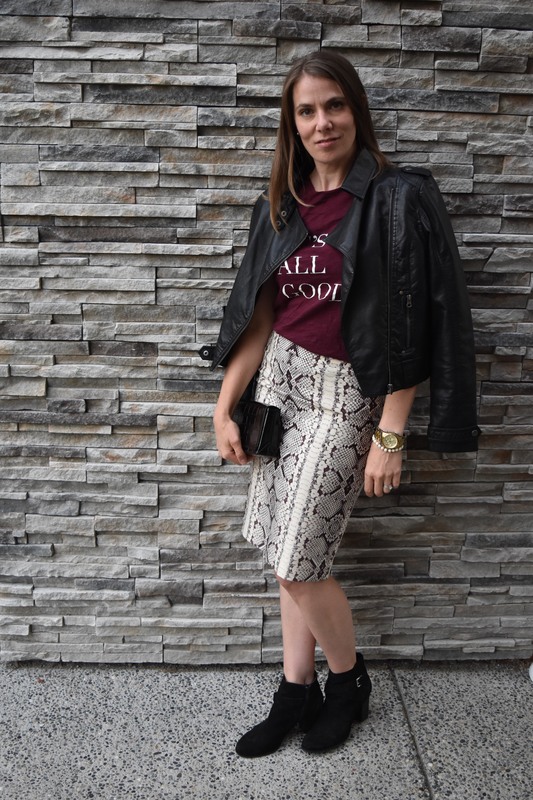 Pairing a skirt with an inherently casual item like sneakers results in a great mix that is stylish, fun and casual. Please note, when I say sneakers, I don’t mean your workout shoes or those ratty old trainers you save for hiking in the mud. I’m referring to athletic-inspired flat shoes you wear for running around, not for running. I enjoy wearing my skirts with sneakers. I have had this long tube skirt in my closet for many years. It’s super comfortable (I can sit cross-legged in it if I want), washes easily and I wear it to work regularly with a silky top and heels. I also love to wear it with my classic Converse Chuck Taylors. 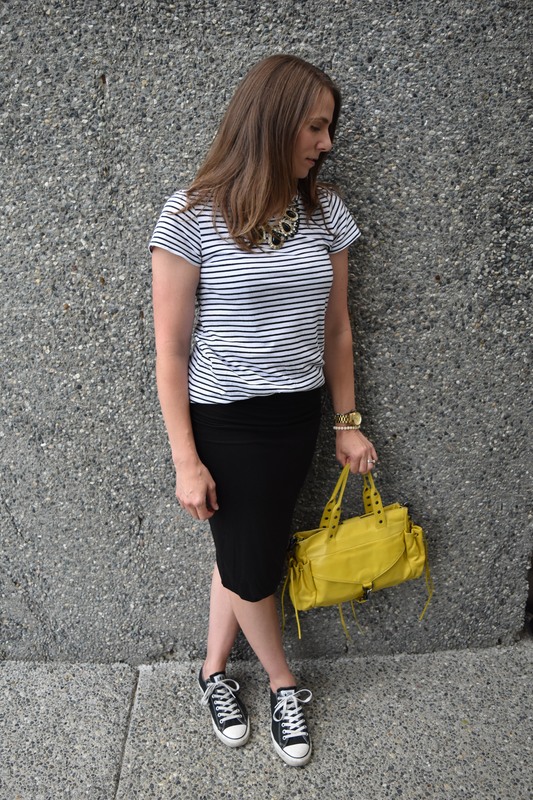 This skirt is even better than shorts for a styled casual mix with my striped T-shirt. It’s just right! When you pair something bulky or voluminous with a skirt, the inherent dressiness of the skirt is downplayed. The casual factor of your outfit is highlighted by the oversized top you wear. 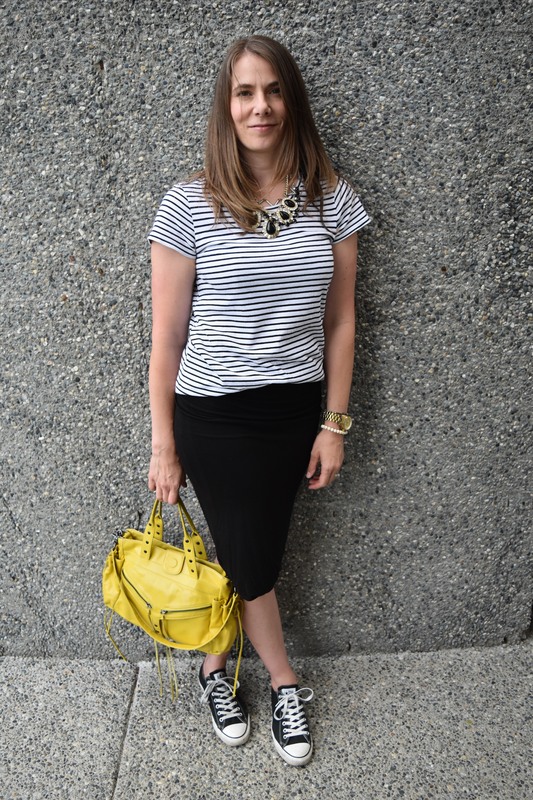 You’ve heard me talk before about pairing loose with fitted, and this is definitely a way to work a skirt on the weekends. Keep the skirt close to your shape, or show a little of the skirt’s waistband to keep from looking frumpy. I adore this sequinned skirt that I got for a holiday work event last December. I want to wear it every day! I refrain from wearing it to my office job, but I love the idea of wearing it on the weekends and evenings in a more casual way. 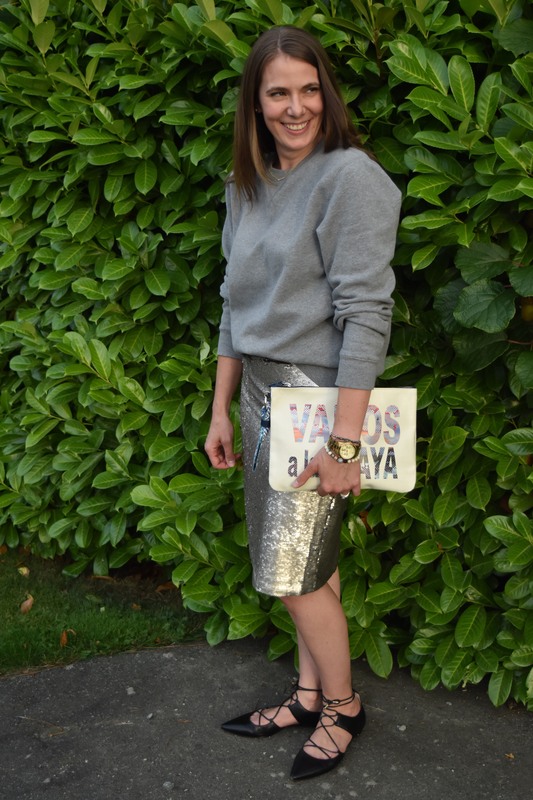 I’ve paired it both with my loose-fitting chambray button up and with my oversized boxy sweatshirt, to help temper the inherent glitzy-ness of the sequins. 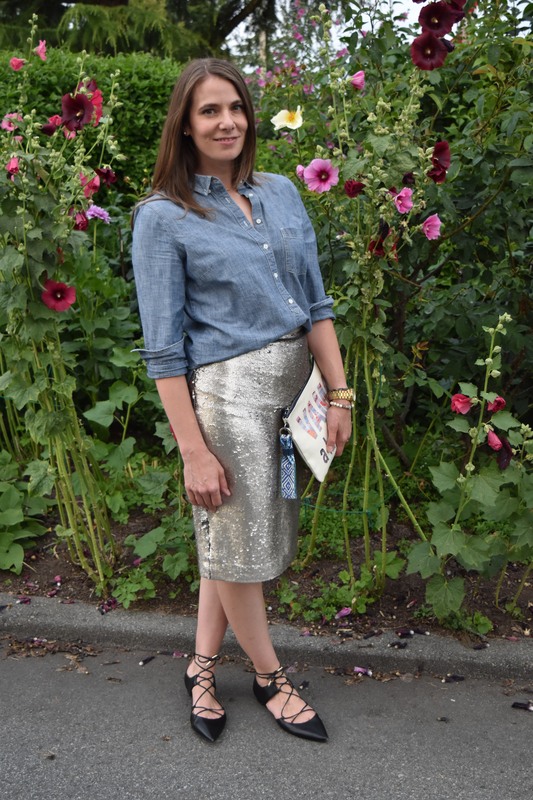 While any skirt can be worn with an oversized top to make it casual, I think these shirts do a pretty good job at making my sequinned skirt ready for, maybe, a Wednesday night restaurant meal. For more tips on mixing up your wardrobe for maximum versatility, book an Essential Package with The Joy of Style.